After playing with the drivers, settings and other awesome information here, and not wanting to create large memory spaces in my windows, I decided to try getting a viable working solution without any special modifications to windows. The end result being that I have the Radeon 460 working on the internal MBP dispay and the eGPU working on a display plugged into the external card. The workflow is just that I have to boot up, open device manager, disable card, flick a switch off and then on and finally re-enable. Not more than 30 seconds of extra work per boot. YMMV but this workflow seems to be good enough for me. Let windows install. Once windows had completely installed, shutdown the computer. Everything should work now, except that the card won’t work correctly when you reboot. When starting up or rebooting, keep the card plugged into the same port as above; the left hand, closest port to you. Disable the device and then turn off the card at the power source in the back of the akitio box. Turn the akitio node 3 back on. Notice that the card has now reappeared as disabled. Enable the card and all should work. I’ve noticed zero stability issues while gaming for hours and doing all the benchmarks. This means that I have the 460 working on the internal display and the 1080ti working on the external display. I did see a performance degradation of about 10% comparing the 1080ti’s benchmarking in Heaven to those found online. But having the allocation address problem in Windows, I don't understand how you can do that without the penalty of disabling other things in the computer... Someone understands?? Interestingly, I have not experienced this issue with the above method. It's untested as to why I do not have these issues but I certainly have not disabled anything. I'm happy to provide screen grabs or system reports/logs if anyone wants to take a deeper look. "13. Enable the card and all should work." I'm doing exactly this on a near-identical setup, and it's not working at step 13. Disabling, switching off, and re-enabling is as you describe, but my GPU still shows Error 43. Any thoughts? Thanks! Just some quick troubleshooting steps or variables I left out. Do you have a 15" 2016 Touchbar? Otherwise I also have the power connected through the far right-side and a usb hub connected to the near-right side plug. (Unsure if this should matter). Is your firmware for Ankitio Node 3 updated per the latest on their website? Windows will hang while booting...the spinner would literally stop at the exact same spot every time if my eGPU is plugged in before I turn on my machine. I can only plug it in after the system boots and I could install drivers, etc, but that's about it. The card would still not work. Have you encountered this? 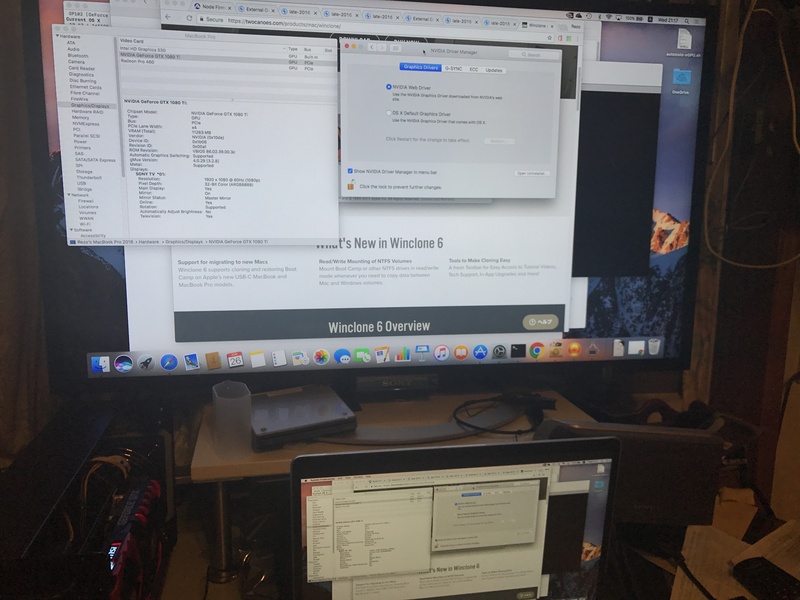 I am able to get my setup to work under macOS...so I know the hardware is functional, FYI. 1. How do you manage your graphic card drivers? Do you just install drivers for both sides? Do they cause problems when you are plugging in/out or when the eGPU is not connected? 2. Can you manage to use eGPU acceleration when you are only using internal display? At first I got an error code 43 with the windows default driver, then I just downloaded and did a clean install with the latest nvidia driver (381.89). After reboot, it worked just like a magic, did not even need to disable and re-enable the device. nothing else was needed, may be because of the windows insider program update with extra support of eGpus? *edit* ran the benchmark and a few reboots. benchmark has similar result from konceptz's and I am satisfied with it. Thank God. and yeah, macOS worked magically smooth as bootcamp. went to nvidia driver manager, set the radio mark to nvidia webdriver, reboot again and boom, everything just worked out beautifully. Hey. Did you try booting with the connector in other ports? For me, the port closest to you while facing the computer on the left side is the one that works, otherwise I get the exact same issue as you described . Hey Rezo. I noticed that the pci usage is not high. There are benchmarks showing 16 > 8 pci is not major. I have a feeling that the physical distance is a more major bottleneck. Will report back. It turns out that you would have to go through many hoops just to enable the integrated graphics card in order to get the eGPU to work with the port on the left further away from you. That alone cost me many hours of frustration. After reinstalling my Windows 10 and trying your suggestion, it worked right out of the box. I didn't even need to install drivers from nvidia installer...Windows grabbed an older version of the card driver from windows update and everything worked as expected. Great! I'm glad you got this up and working. It's still a bit of a hack but much easier than some of the workarounds. 1: I only installed the Nvidia drivers after the Radeon drivers from boot camp were installed. So technically both sides. This method works for me too (Macbook Pro 2016 15" RP450), but I was getting error 12 all the time until I started disabling and enabling Tunderbolt PCIe bridges, then I got error 43 and followed your method. My 980Ti is running at 8x but I can live with that. After rebooting I'm getting error 43 again, just had to disable my 980Ti, turnoff Akitio Node (wait 1 sec, lol), turn on Akitio Node, enable 980ti, done. The apple_set_os.efi thread has been given a reboot for easier implementation. If you want to try again the benefit is you'd gain a NVidia Optimus eGPU accelerated internal LCD mode. There is a documented RP4xx late-2016 15" MBP confirmed success. Thank you so much for this! I'd spent hours working on other methods to no avail. With 15" 2016 MBP with AMD RP 460 I don't even have to restart anything on startup - the 1080GTX with Akitio Node works immediately . Because the fan is annoying and I only want the external screen to support the graphics card I have a Belkin Wemo plug so I can turn the Akitio Node and monitor along with attached USB mouse without having to go under the desk. I feel like I may be missing out on some performance though with it being attached to pcie8 rather than pcie16. Have you found a work around for that? For reference At 3440 x 1440 on Battlefield 1 I'm getting 55 - 60 FPS on Ultra compared to 86 - 92 FPS when I had it inside a gaming rig 6600k OC'd to 4.6Ghz. It's a shame I can't test the same setup while keeping the same processor. For the past week, I have also noticed that error43 no longer occurs, I guess microsoft may have improved the capability with their recent windows updates? Hi. I have the same exact 15" 2016 MacBook + RP460 and I don't know how you guys aren't getting error12. I tried using the port you suggested but still get error12. I wonder what the difference is. If you guys have any insight, please let me know. Hey how is this method still working ? I just received my 1060 GTX , only waiting for the Node now. I wanna try this method first, because i rather not modify anything if i dont have too. As a side note, my macbook pro monitor is never on, I have it docket, using a LG34UX98. Method is working perfectly still. I just did a performance test with my friend's 1080TI. 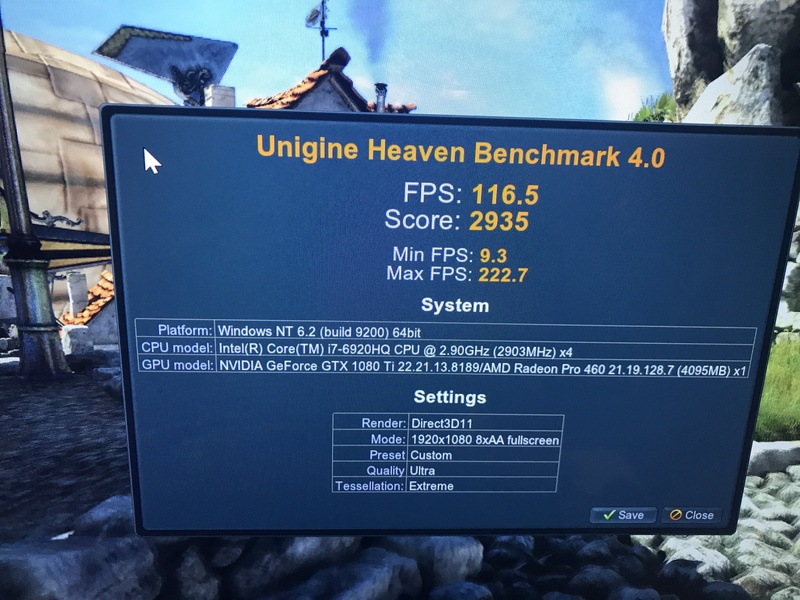 We did a heaven benchmark and he got 14 FPS average more than me, so a little over 10%. The dramatic jump that you show may not be due to the gpu only. The processor above should be MUCH faster than the MacBook's i7. Can you help me? I've got the Macbook Pro 15" with radeon Pro 460. I did a clean bootcamp install yesterday (Version 1703) but it doesnt detect the node nor the gpu in it (1080). Which thunderbolt drivers did you use? Seems like mine won't work. Interested in going a similar route with my '17 15'' MBP. How is the external monitor connected? From the Mac or from the eGPU? Any extra lag when gaming? Difficulty in getting Windows to install drivers? Thank you so much for this! I spent countless hours getting my Node to work with my 2016 15 MBP. What I found though was that my Node only works when plugged into right side Thunderbolt furthest away from me (closer to the screen). I tested all 4 ports and this was the only one that works. Note to others who can't get it to work, try every thunderbolt port to see if any other port works. 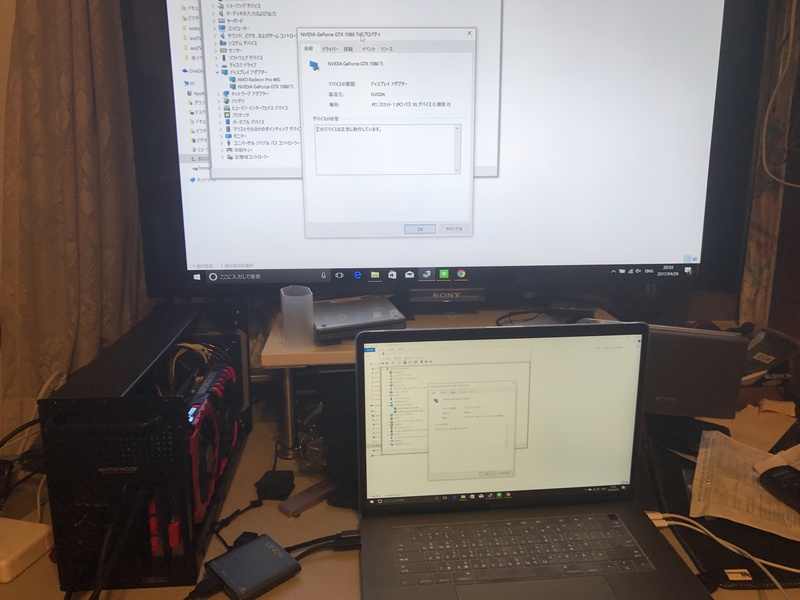 Hey all, I had the Akitio Node working with the configuration listed below, then something went wrong, and now Win 10 won't pick up the eGPU as a Display Adapter. It shows up at the bottom of the Device Manager as a "Thunderbolt(TM) Controller - 15D2". I'm a bit in panic mode here because I've been working on this setup for a while now and dropped big $ on a 1080ti and other items, now all of the sudden nothing works and I don't know what I did. If someone could help, I'd return the favor (literally). I've also done quite a bit of research on this setup and since I had it working, I can help others who aren't having this specific issue. As a last resort, I disabled the Intel 530 display adapter (stupidly while in Windows) and it crashed, but worked again on next boot. I re-enabled it, but now I have this no eGPU issue. In looking at my Windows version to make this post, I realized that Windows is in UEFI mode, which may be correct, but I never thought to check when it was working. Should it say EFI, or is UEFI correct? I'm currently using the latest apple_set_os.efi). I've read elsewhere that reFind's OSX spoof stopped working around OSX 10.12.3/4. This all worked for me last night (7/13) and I've been running 10.12.5 since 7/9, so I have a feeling I messed something up at a boot level somehow by disabling the Intel 530 earlier. If anyone has thoughts on this, please let me know. I'm in very deep now and need to get this working (even if it kills me lol). If I fix this before I get a reply, I will post my solution in case anyone else has this issue (like @Jenubis). Side Note: I'm "very" passionate about getting this MBP + Akitio + Internal/External Display setup working, and eventually working as flawlessly as possible, and I am a web software developer, so I'm very open and interested in participating in this eGPU community as we progress, so if anyone can help me fix my screw-up, I will return the favor for sure. UPDATE (7/14): After researching more to better understand UEFI, apple_set_os.efi, etc, I updated some of my lingo to be less confusing to those who understand it better than me. Still need help lol. UPDATE (7/16): After installing the 1080ti and playing with eGPU hot-plugging timing, I was able to get the GPU working again. Strangely, I'm no longer able to hot-plug the eGPU ~1-2 seconds after the Windows Logo/Spinner. MY window is about ~.5-1 secs after I click on the Windows Bootloader option. The external LCD also works now w/ full G-SYNC support. Remaining challenges listed below if you guys have input. - Passmark Graphics Mark score is only 8184, when I believe the average on a normal rig is ~13,400. GPU-Z states the 1080ti is running on PCIe x16 3.0 @ x4 1.1 and shows up under the x8 PCIe Controller in Device Manager. It seems to me that it's not properly running at x16. Does anyone know if this is true and how to fix it?